Ready to make the best Scrabble tile pendant possible? 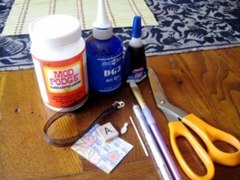 This easy tutorial will show you how to make your own custom necklace out of a Scrabble® tile. It will take about 1 hour of work, but there is time needed to let the pendant dry and cure. 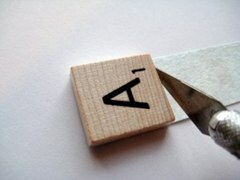 Apply a small amount of your decoupage medium/glue to the blank side of the scrabble tile. Carefully glue your paper to the tile and press gently to remove any bubbles. Turn the scrabble® piece over and carefully trim away the excess. Turn the piece back over and smooth out the edges with your fingers if there are any raised areas as a result of the trimming. Very gently file the edges of the paper to make sure they are in line with the wood scrabble piece. Be careful not to file the wood itself. 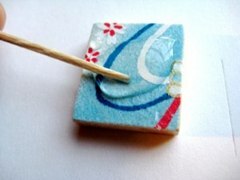 Using your paint brush, apply a thin layer of mod podge to the front of your tile making sure to cover the entire thing. Then Grab your dimensional glaze and apply a thin layer to the top of your tile. Diamond Glaze is a popular dimensional glaze brand, and there are many similar products on the market. It's a matter of preference. I personally like DG3 over the original Diamond Glaze since it spreads easier and produces fewer bubbles. Experiment to find a brand you like. Set your tile aside on a level surface where it can remain undisturbed for several hours. Drying time will depend on the thickness of your glaze and the humidity in your area, so be patient! When it's all dry, congratulations - you know how to make perfect scrabble tile pendants. Don't touch the protection on the top before it is dry - it can leave fingerprints. Experiment with several types of designs to see what you like the best. You can attach a necklace bail to the back for hang it however you'd like.